Request Form for requests sent by the postal service. Online Requests for e-mail requests with PayPal payment only. Don't forget postage and packing! LABIATAE. Ornamental herbs and shrubs. 'GREEK MOUNTAIN TEA'. Yellow 1/2" flowers in spikes. Perennial to 10 - 20", with 2" white-woolly leaves. Crete. Zone 6. Brewed into a golden-colored aromatic tea. Germinates in 1 - 2 weeks. CARYOPHYLLACEAE. Five hundred species of North Hemisphere annuals, biennials and perennials with showy flowers produced in profusion. Easily grown and valued in the border or rockery. Best in full sun and sandy soil, and even the annuals can be sown in fall for earlier bloom. Most kinds germinate in 8 - 23 days and flower quickly. They have extrafloral nectaries. 'XHOSA DREAM PLANT', KWAQUELA', 'MOLOKOLOKO'. 'White to pink five-petaled flowers. Perennial to 1 - 2 feet, with 1 - 3" leaves. South Africa. Moist sandy soil. 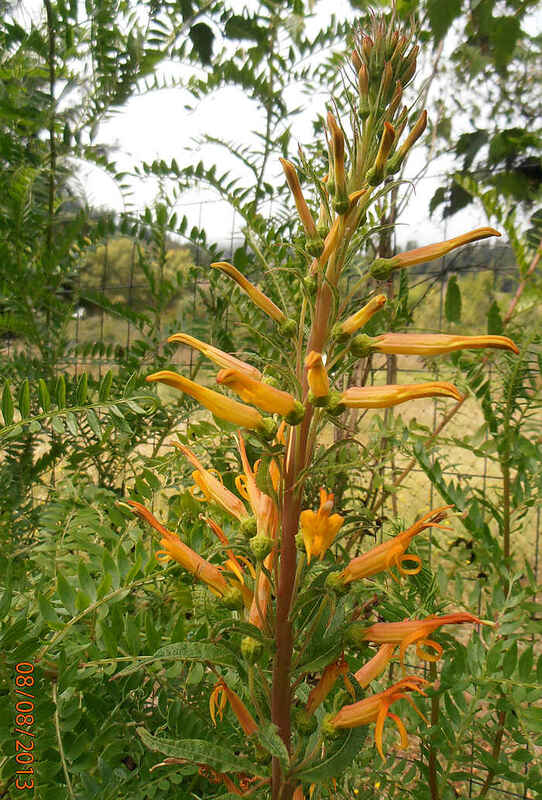 The root is said to be used by the Xhosa to induce vivid dreams. Germinates in 3 - 8 weeks, best with 2000ppm KNO3 (potassium nitrate), or GA-3. COMPOSITAE. 'MILK THISTLE'. Striking plants. Sow in fall or spring where they are to grow and thin to 2 feet apart. Sprouts in 1 - 3 weeks. An interesting note: fresh seed will not germinate at warm temperatures, only sprouting at cool temperatures; but after 5 months dry storage (after-ripening) they will germinate well at warm temperatures. 'ST. MARY'S MILK THISTLE'. Bold and striking rosettes of large glossy, dark green, spiny leaves streaked and marbled with white, followed by 2" wide rose-purple, faintly scented flower-heads on 4 - 6 foot stalks, each head with dramatic reflexed spines. Mediterranean region. Zone 4. Old tradition holds that milk of the Virgin Mary fell upon the plant, causing the white marbling of the leaves. Flowers much visited by bees; later, birds love the seeds. California ranchers claim it loosens hard, compacted soil, and make their own 'clod-buster' from chopped plants soaked in 55 gallon drums of water. Formerly much used as food; the young leaves in salads or boiled, (I've never tried this myself, the spines scare me!) the peeled stalks, the roots like salsify, the young heads eaten like artichokes after cutting off the spines. Was thought to increase milk in nursing women. Since ancient times the seeds have been used as liver medicine, and recently their powerful liver-protective properties have found much use in modern medicine. Experiments have shown it capable of preventing death in dogs from fatal doses of Destroying-Angel mushroom toxins. IRIDACEAE. 'BLUE-EYED GRASS'. Small American grass-like perennials with blue or yellow flowers. They make nice colonies in open moist places. Easy in any soil. Good in pots. 'BLUE-EYED GRASS'. Blue 1/2" flowers on winged stems. Deep green grass-like leaves. Hardy short-lived perennial, reseeding itself. 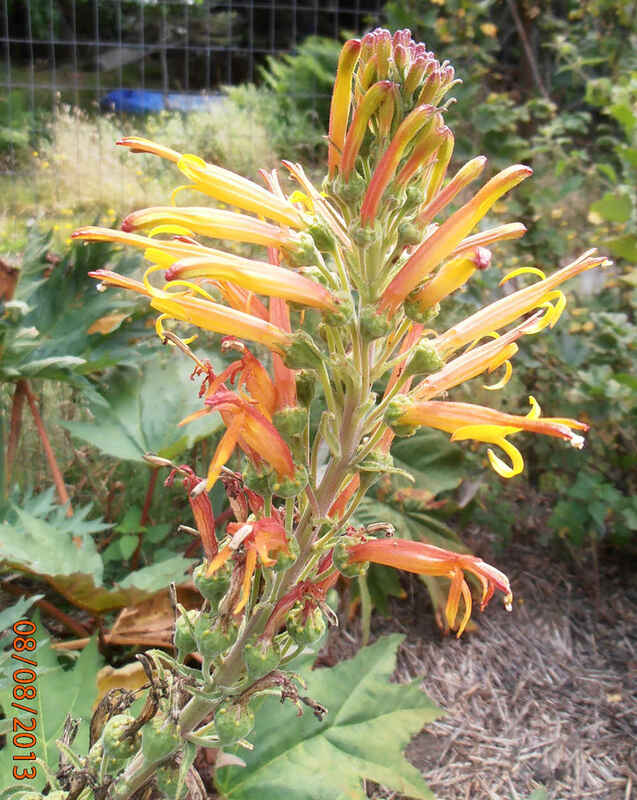 Reaches 2 feet in good moist soil, but will grow in dry shade, reaching only 4 - 6". E. N. America. Used medicinally. Sow in fall. 'YELLOW-EYED GRASS'. Yellow inch-wide flowers in late spring and summer. Clump-forming Iris-like plant to 6 - 24". Moist meadows, California to Oregon. Germinates in 2 - 4 weeks and up. Zone 8. "A good garden subject.—"Hortus Third. Bright pinkish purple nodding 3/4" flowers with lighter centers, on a dainty plant to 6 - 15" tall, with narrow, grass-like 2 - 3" leaves. Washington. Zone 5. "Besides love and sympathy, animals exhibit other qualities connected with social instincts, which in us would be called moral; and I agree with Agassiz that dogs possess something very like a conscience. "—Charles Darwin. UMBELLIFERAE. Hardy Old World biennial herbs with handsome divided foliage and yellow flowers. 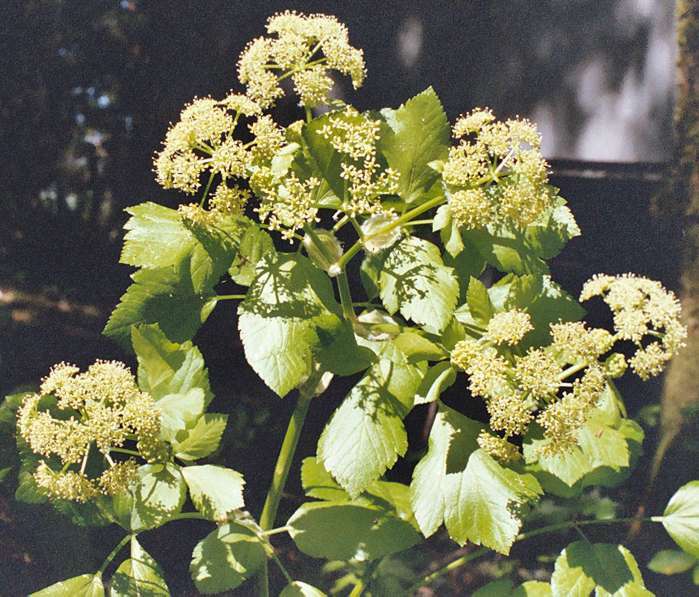 'ALEXANDERS', 'BLACK LOVAGE'. Stout biennial or perennial to 4 feet, with large glossy bright green divided leaves. Yellow flowers in 4" umbels, followed by black 1/4" fruits. Mediterranean. An ancient vegetable, it is mentioned by Theophrastus (322 BCE), was cultivated by Charlemagne (800 CE), reached the height of its popularity around 1550 to 1650, and had almost disappeared by the late 1800s, being displaced by celery. The young shoots and stalks were blanched and eaten, and have a celery-like flavor, but more pungent, and were used to flavor soups and stews. The sliced root was eaten raw in salads. Unopened flower clusters eaten. Germinates best in summer, seed sown in August germinates in 2 weeks. Fresh seed needs cold treatment. Hardy to Zone 5. Seedlings thinned out can be eaten. A forgotten plant. Germination is greatly increased by rubbing the black husks off the seed to germinate in 3 - 6 weeks without cold treatment. SOLANACEAE. A huge genus of 1400 species, from annuals to trees. Includes important foods (potato, eggplant, etc. ), medicines, industrial crops and many ornamentals. Generally easy from seed, germinates in 1 - 3 weeks. Sow hardy types where they are to stand, and tender types early indoors. They are wonderful plants, many very ornamental, but surprisingly little grown. Buy 'em or lose 'em! 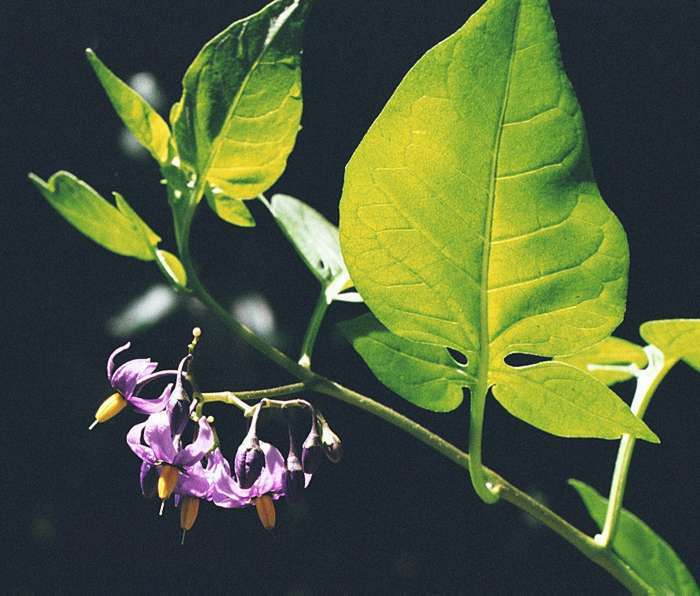 Nice collection of photos of Solanum species. Striking ornamental with purple spines up to an inch long covering the entire plant. Tomato-like flowers followed by inch-wide round yellow-orange fruits. To 6 feet, with lobed leaves. Grow as an annual. "I grew a gnarly Solanum atropurpureum from you. It grew six feet high, was completely covered with very respectable thorns, and had a baleful purple cast to the whole thing. I called it 'Malevolence'. Thank you."—Kaminsky. Germinates in 2 - 4 weeks. 'WONDERBERRY', 'MSOBA'. Deep blue 1/4" fruits with white bloom are sweet and edible, used for tarts, jams, etc. Compact annual to 2 feet. Caused a great controversy when introduced by Luther Burbank. Delicious and productive. Sow on the surface, seed needs light or GA-3 to germinate in 2 - 3 weeks. 'BITTERSWEET'. Violet five-petaled, yellow-stamened 1/2" flowers spotted green, followed by ornamental clusters of oval red berries. Woody climbing shrub to 15 feet. Eurasia, N. America. The dried stems were once widely used in medicine, and the roots and shoots used medicinally in China. Used for rheumatism, skin ailments and alterative. Germinates in 2 - 4 weeks, best with GA-3. 'GALAPAGOS TOMATO'. Endemic, salt-tolerant wild tomato with tasty orange-red fruits. Cultivated material has probably had some crossing with garden varieties. Germinates in a week or so. 'RUFFLED RED EGGPLANT', TOMATO-EGGPLANT', or 'HMONG EGGPLANT'. 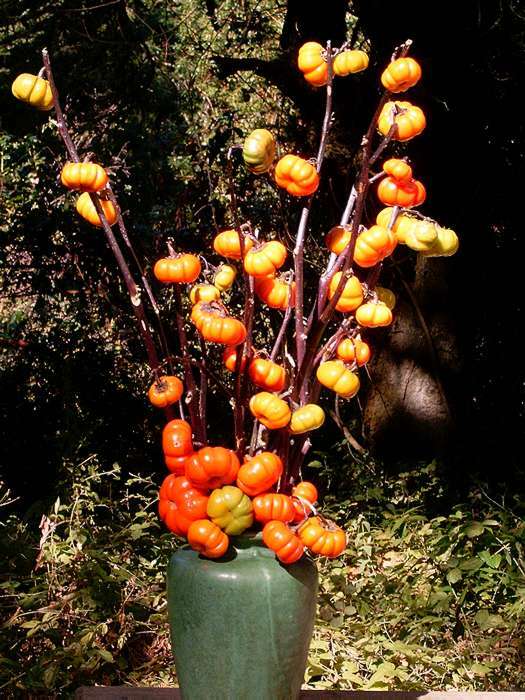 Orange-red 1 - 3" ribbed fruits valued fresh or dried in flower arranging. Spiny annual to 8 feet. Tropics. Used in SE Asian cooking. 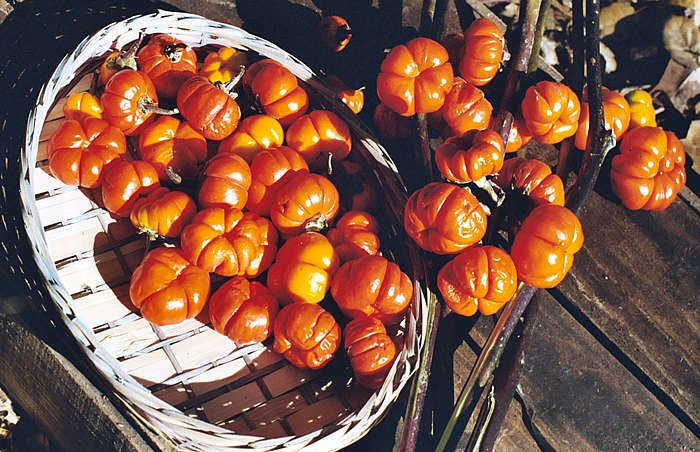 Sometimes called 'mini-pumpkins' in the flower-trade. Germinates readily in 2 - 3 weeks warm. LABIATAE. Tropical East Hemisphere plants. 'BLACK COLEUS'. Velvety purple-black 6" leaves, the darkest! Light blue flowers in slender spikes. Zone 10. Sow an the surface to germinate in a week. LEGUMINOSAE. Wide-ranging and showy ornamental mostly woody plants with clustered pea-like flowers and handsome pinnate foliage. Best in well-drained soil, and most stand drought well. 'MESCAL BEAN', 'TEXAS MOUNTAIN LAUREL', 'FRIJOLITO'. Beautiful fragrant violet-blue inch-long flowers in dense 3" clusters covering the plant in spring. Handsome evergreen shrub to 4 - 6 feet, rarely a tree to 40 feet, with shining dark green pinnate foliage. Silvery grey 1 - 8" pods with bright red seeds. Texas to New Mexico. Can stand a good freeze—Zone 8. Well-drained soil. The poisonous seeds are used as beads and ceremonially by Plains Indians, and are powdered for insecticide. Nick seed to germinate in 1 - 4 weeks or so. COMPOSITAE. Tropical creeping herbs with yellow or white daisy-like flowers on long stalks. 'TOOTHACHE PLANT', 'PARA CRESS'. Abundant red-tipped yellow clover-like flowers on a sub-tropical creeper with pointed triangular leaves. Tropics. Zone 4. The young leaves are added to salads, soups, or steamed with rice. They stimulate the saliva and cause numbness and tingling, so they are chewed for toothache. Anti-viral and anti-fungal. Used as a flavor-enhancer. Germinates in a week. "So the universe would be a very great book, and we would be very small readers."—U. K. LeGuin. LABIATAE. Widespread perennials and annuals adapted to varied conditions, from dry to wet. Tubular, often hooded flowers in whorls, and often aromatic foliage. Some are medicinal. 'WOOD BETONY'. Very rich purple 1/2" flowers in dense whorls and spikes. Hardy perennial to 3 feet, with 3 - 6" leaves. Europe, Middle East. Zone 4. Good ornamental, formerly much cultivated for medicinal use. Highly regarded for many ailments, and believed effective against 'devils and despair'. The tea is a fine beverage and was formerly valued against persistent headaches. "Sell your coat and buy Betony. "—Italian proverb. Germinates in 2 - 4 weeks. ASCLEPIADACEAE. Tropical climbers and shrubs grown for their beautiful flowers. Popular in the greenhouse and outdoors in the South. Feed while growing. Germinates in 2 - 13 weeks, warm. 'MADAGASCAR JASMINE'. Very sweetly scented 1 - 2" waxy white trumpet shaped flowers in long-lasting clusters from April to October. Twining evergreen climber to 10 - 15 feet, with glossy dark green leaves. Madagascar. Zone 10. A popular greenhouse plant. The flowers are traditionally used in wedding bouquets. Germinates in 2 - 8 weeks, some up to 16. COMPOSITAE. From the warm Americas. 'SWEET LEAF'. Small shrub with tiny white flowers and narrow leaves. Paraguay. The dried leaves are used as a no-calorie sweetener. Surprisingly hardy, standing some freezes and renewing from the base. Germinates in 1 - 2 weeks. TERNSTROEMIACEAE. Showy-flowered hardy ornamental Asian & N. American trees and shrubs. The handsome foliage turns deep wine-red to orange in fall. Best in deep rich porous soil, and a warm sunny place in the North. Likes acidic soil, similar to Rhododendron. Soak seed 2 - 3 days. White 1 1/2" flowers with violet anthers. Shrub or tree to 80 feet, with downy young shoots. Japan, Korea. Zone 6. Multi-cycle germinator, hold pots over several seasons. CAMPANULACEAE. Lovely and hardy Eurasian perennials and biennials with white or violet bell-shaped nodding flowers. Grow like Campanula. Germinates in 2 - 4 weeks at warm temperatures. Large, nodding, creamy 1 1/2" bells from May to August. Hardy perennial to 2 feet, with downy, heart-shaped to narrow leaves. Caucasus. Zone 6. Germinates in 1 - 2 weeks. Abundant, nodding, bright violet-blue bells on slender stems, June to August. Hardy perennial or biennial to 10", with geranium-like leaves. Caucasus. Zone 6. Germinates in 1 - 2 weeks. OLEACEAE. Showy deciduous Eurasian flowering shrubs and small trees. 'JAPANESE TREE LILAC'. Creamy white musk-scented flowers in foot long clusters in summer. Small tree to 30 feet, with 5" leaves. N. Japan. Zone 4. Germinates in 4 - 12 weeks.